Earlier: Not a pretty girl? I recently discovered mango myself, and wondered why the heck I never bought them before. If you like the flovor combo of sweet and spicy, here’s a simple way to prepare mango. Combine a couple spashes of lime juice with a dash or two of cayenne pepper. Then, toss in chopped mango. Yummy! Until last year I held this belief that I hated kiwis even though I’m pretty sure I had never even had one before. Anyway I started buying them and I love them now. Golden kiwis are good too. Check out one of my favorite sites, chow.com. The kiwis are much better without the skin, it’s too gritty for me! I like to eat my kiwis with the skin, but when I wash them, I hold the kiwi under the tap and rub a paring knife over the hairiest parts (usually just around the ends) to shave off the worst of the hair. Kiwi is also pretty ace in yogurt. To PastaQueen and Olivia, green unripened mangoes are great to eat with lime juice, salt, and chilli powder or cayenne pepper. Can’t quite get into a mango but it is a flavor thing for me. Kiwi’s are the bomb – my kiddos crave, love, and steal these from their poor mama! We enjoy making a game of trying new things from the produce section too. Recently we discovered plumcots (cross between apricot and plum) they are yummy! Then we also discovered a mango nectarine. It is a bit smaller than a nectarine, with yellowish color and scent of a mango. The taste is a nectarine with a subtle hint of mango undertones. I can handle mango in this dosage – very yummy. We are in Michigan and found these at our local Meijer – bet you can find them where you are too. P.S. we even tried roasted parsnip in our other roasted veggie combo based on a previous post you had – Very delish. Thanks for the idea. Great stuff :) Tis the problem with mangoes, they’re either really amazing or meh, depending on how far they had to travel! My mother used to eat kiwis whole, carpet and all! It was horrifying to watch. I once visited a kiwi plantation in South Carolina. It was more interesting than you might think — and like all produce, the kiwi I bought straight off the vine were SOOOOO much better than what we buy at the grocery store (and much less hairy). You must check out golden kiwi if you ever see one in the store. The flesh is a beautiful golden color instead of green and they hardly have any hairy stubble. Indian mangoes are supposed to be simply divine. They were forbidden in the US until just recently but I’ve yet to find one in any store, including Whole Foods. So if you could find one it might be worth another try. Wait, you ate the kiwi skin, carpet fuzz and all? Ick! I’ve heard of people doing this before but I just can’t wrap my mind around why anyone would find this appetizing. Although in your case it sounds like more of a practical thing… eating fuzz = less dishes to wash… Still though, I couldn’t do it! I’ve never gotten into the mango flavour myself, but I LOVE papayas! You should try those next if you haven’t already. FYI if you do – don’t eat the skin or the brown seeds in the middle! Cut ’em open, scoop out the seeds and eat the yummy flesh. There are a lot of wonderful Indian dishes that highlight green mango, from curries to chutnies. Yum! My son eats kiwi by slicing them in half and scooping the insides out with a spoon. Yes, this dirties two utensils, but it sure is easier than the way I prepare them, peeling and slicing. I can’t imagine eating the skin. Ugh!!! WHOA! Purple cauliflower! That is coooool. Cut a ripe mango in half, being careful to run the knife alongside the broad, flat seed. Then score each half with cross cuts. Using a spoon, you can then simply scrape out the pieces, much like you can do with an avocado. Chopped mango, combined with a little red onion, some japapeno, chopped tomato, fresh lime juice and sometimes, a bit of chopped cilantro, makes a refreshing and wonderful salsa that’s great on fish and chicken. It’s also great right out of the bowl with a spoon! I actually bought a mango cutter…I love the mango.. I love it with spicey stuff and just plain..
And BTW – grilled mango – super yummy. I also started grilling up my peaches and nectarines… its like eating an amazing dessert!!! I am also a huge fan of the cauliflower… I roast the orange ones and use the yummy cauli instead of pasta for a super calorie friendly version of mac and cheese…. I also just read an amazing recipe for roast cauli in the Chez Panisse Veggie cookbook — my version will involve whole wheat penne, fresh herbs, roasted cauli, toasted walnuts (just a few) and fat free feta…. 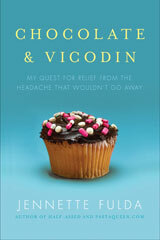 Oh, if someone could put all of the vegetables I need into a pill I would take it. This post is inspiring me to take a visit down an aisle I rarely visit…produce. Thanks for the pictures, now I’ll know what I’m looking for. I had no idea that people actually eat the skins of Kiwi. I couldn’t do it. Too fuzzy for me. I peel the skins off before I eat them. They are such a yummy fruit though. I need to buy some! I love mangos and like paypaya and the other island fruit! Kiwis rock too. I need to be better about eating more veggies than just my usual. I will this weekend, I’ll go for zucchini and some portabello mushrooms or something. I need to expand from my usual salads. I eat kiwis skin and all with absolutely no problem. When you wash them you can give them a bit of a scrub to get the hairiest bits off. I grew up in northern Australia, so mangoes were just a staple. They were so unlike the things I see in the supermarket though, there is simply no comparison. We had mango and pawpaw trees in the back yard. When the season was in full swing my mum would slice the mango and sprinkle the slices with lemon juice and a little sugar and freeze them. Semi frozen mango is a taste sensation. One other thing you need to have a go at, if you ever see them, are passionfruit. They are purplish and wrinkly (when ripe) and the inside seeds and juice are ambrosial, and fantastic used in combination with other tropicals like pineapple kiwi, mango etc. Have you seen the purple congo potatoes? I thought I was going to have Elvis purple mash when I forked over my cash for them. Good taste, but the flesh wasn’t purple. Oh well. Congrats on your further exploration of the produce section though. It’s very exciting to discover stuff like that. I used to think I hated mangoes and they tasted like pine trees. Then I bought one that was really ripe. My key is to buy one that is very soft and even has a small flat spot where it sat on the shelf (shows its softness). They are great plain but I make mango smoothies all the time: one whole mango, pitted/peeled and sliced, into the blender with a half cup of fat free yogurt (plai or vanilla) and a bit of juice (orange is good) and 4 or 5 ice cubes. Blend up, tastes like Indian Lassi and very healthy breakfast! Add frozen blueberries if you want. Yum! AKS – I’ve only eaten ripe mango with lime juice and cayenne. Unripened is not sweet enough for my taste. 1. To me, mangoes taste like a mix of ginger root and pineapple. 3. You have added a food I have never eaten before. I’m not sure I’ve even SEEN the purple about. What’s stranger is the GREEN cauliflower! My youngest daughter will only eat it if its purple, my hubby only wants white, my eldest daughter doesn’t care, loves them all! Kiwi are yummy, though I hate the way they feel while you peel them. Mangoes are a fave here, but for some reason THESE bring fruit flies into the house more than any other thing we every get. (this is why I wash everything as soon as it enters the house). Kohlrabi – SO delicious, eat it raw! You might find it at your regular market, or at an asian market. Purple carrots! naturally purple. But they do taste like regular carrots, I think. bok choi is SO good raw, in salads. you’ve probably had it cooked in chinese dishes, but have you had it raw? also, fruitwise, i’ve been eating many, many different varieties of plums and pluots at the farmer’s market – purple ones and yellow ones and red ones, white fleshed, yellow fleshed, red fleshed, sweet, tart, mushy, firm. . . i’m partial to santa rosa plums and flavor king pluots. highly suggested! I cut mangos just as described in your link, except I don’t scrape the scored cubes into a bowl. I lean over the sink, invert the concave half to make it convex so the lovely mango cubes are sticking up, and then I begin feasting, eating the cubes right off the inverted skin. During the process, sweet spicy mango juice tends to dribble down my arms and drip from my elbows. Inbetween mouthfuls, little animal-like sounds of pleasure have been known to escape me. After I’m finished the two divine mango halves, I then start on the seed. First I peel off the skin, and then I use my teeth to help scrape off every last bit of juicy pulp from the seed. With regret, I finally deposit the denuded hairy seed and mango skins into my compost bucket. Then I go floss my teeth. In my experience, it’s rare to know the utter sense of fulfillment a mango brings. i totally get the cannibalism vibe. i used to think the same thing about the frugal gourmet: “the frugal gourmet cooks his immigrant ancestor’s” because time warner would always cut it off before adding the work “recipes” at the end of the info screen. tee hee! I loved this post, because I love mangoes! 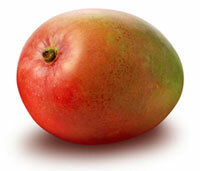 One thing though, mangoes won’t change color no matter how long they sit. Once picked, that’s their color. Also, their color doesn’t determine ripeness- a green mango may be riper than a red one. When you’re choosing a mango, try smelling it- it should have a sweet smell. Better yet, if you like them really soft and sweet, try the honey mangoes- the smaller, yellow mangoes. These do literally taste like honey… mmmmmmm. My kiwifruit method: I slice it in half and eat it with a spoon, as if I was eating a soft-boiled egg in the shell! One of the best salads I ever had was at an authentic Mexican restaurant and it was made of mangos, avocados and fresh grated coconut. That was it except for the dressing which I have no idea how to make. But the salad was divine! Mango…so good. Unfortunately, we don’t get really good ones here in the US unless you’re growing your own in Florida. Even the best mango you have in the US doesn’t compare to a mediocre mango from West Africa, the islands or India. I love mangoes. They are fun to eat in water – pool, ocean, bath – because then it doesn’t matter how messy and sticky you get. 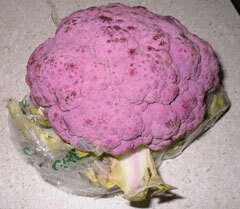 I’ve never seen a purple or orange cauli. Would be fun to get all three colours (and maybe add broccoli) for a dinner party. Hello Jeanette! 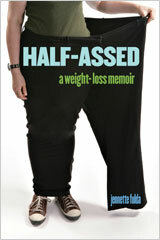 I discovered your blog recently.. and I read it all in two days!. Fascinating. Congratulations! My mediterranean little devil on my left shoulder says: Mangos aren’t very “healthy” because nearly all tropical fruits have a lot of fat. I eat kiwis as yoghourts, slicing them in two and then with a spoon. And I love them!!!! (the mediterranean angel says: and a wonderful source of vitamin C!). I have been a lurker for so long. I Love your writing. I didn’t even know I could leave a comment unless I had a blog or URL. Keep up the good work and I’ll be reading for sure. You sound like a really pretty and fun girl. I say girl because I’m 56 so I guess I’m pretty old to someone your age. I’ve been eating mangoes all week… they are beautiful in a blender with natural yoghurt and a few boysenberries … yum!!! Mangos are soooooo good! Ditto for Kiwi (here’s a weird factoid–people w/ latex allergies shouldn’t eat them). I haven’t seen the purple cauliflower, but have tried the orange, it was very good, maybe a bit sweeter? Not in a sugary way though. Down here in Mexico we eat mangoes like the one you pictures like a popsicle. They are impaled on a stick and cut like a blossoming flower. Squeeze a limon (i guess that’s a lime) and some chile on it and it’s a great snack. My favorites are the ataulfo’s (sp? ); they are all yellow and melt in your mouth like butter. Simply amazing. April is when the mangoes are ripe around the country and we wallow in mangoes all summer long. Do you get mamey up there? It looks like a brown avocado. Put them in shakes; yummy! 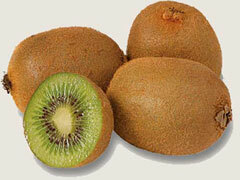 Also, we get yellow kiwi (dorado). They are really good. I don’t like the fuzzy kiwi skin, so for me the easiest way to eat it is to slice it in half and then scoop the fruit out with a spoon. It looks pretty in a fruit salad, too. I think that it’s cool how you’re trying all these different veggies and fruits. I’ve been trying to do this ever since I started watching Chef Kathleen’s old show on the Food network. I actually found out I like things like fennel and asparagus. I don’t like cauliflower at all. And mangoes are a little sweet and bland for my taste. Still, every now and then I find a winner. Since you’re Italian like me, do you like pomegranate? You should watch for them at Christmastime. They’re one of my favorites. We grew up taking them to school and getting the “Eeewww,” response from our classmates. I second the cut the kiwi in half like an egg, and scoop out with a spoon! I couldn’t handle eating the kiwi skin… just not my thing! :D Never even knew people could do that! I like mango, but I’m deadly allergic to kiwi. One of those lesser-known allergens. Damn – we should’ve chatted before your mango experiment because I made the exact same mistakes. Dear God, I will never forget the taste and texture of mango skin. *shudder* After tasting the actual fruit (when it was ripe) I found I’m not a big fan. It’s OK in stuff but I would never pick it. Kiwi is OK as long as all the hairy skin is gone. Purple Cauliflower is a good band name. Michelle – have you tried the Indian mangoes? They recently became available, or so I’ve read in the paper, but I cannot find them near my house. kathy – we don’t get mameys in the states (or I haven’t seen them around much), but we do get the cherimoya (or guanabana). PQ, I want to thank you for these entries. They teach me about fruits/veggies I haven’t tried and they inspire me to try them myself. I also wanted to say thank you to your commenters for teaching me a new way to eat kiwi! I rarely buy it because I’m too lazy to peel it and then slice it. But I bought one last night to try your commenters’ suggestions of cutting it in half and eating it with a spoon. I can’t wait to try it! I haven’t had a passion fruit (what we call granidilla) in years and years, never seen it in the US. I am going to Harry’s farmers market tomorrow to see if they have any passionfruit or/and litchi’s.